Check the guide to see what's on in the city of Stirling, events and things to do around the area, theatre, cinema, concerts, courses, classes, events. Days out, family outings, guided tours, places to visit and things to do around Stirling. One of the most popular visitor attractions in the country, Stirling Castle is the grandest of Scotland's castles. 250 feet above the plain on an extinct volcano, Stirling became the strategic military key to the kingdom during the 13th and 14th century Wars of Independence and was the favourite royal residence of many of the Stuart Monarchs. 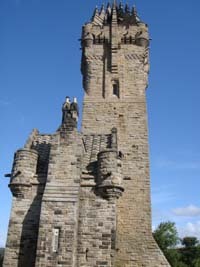 The Wallace Monument is on the Abbey Craig, a rocky crag from which William Wallace watched the English army gather before the battle of Stirling Bridge. 220 feet (67m) high, this Victorian Gothic tower was opened in 1869 to commemorate Scotland's greatest freedom fighter. Commemorating Robert the Bruce's victory at The Battle of Bannockburn in 1314. Building work is now finished on the brand new state-of-the-art visitor centre with interactive battle centre which can be accessed online.